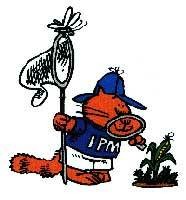 The 2004 IPM Training School has been scheduled for Wednesday, March 17. The meeting will be held at the UK Research Center in Princeton. Registration will open at 8:30 AM with the meeting starting at 9:00AM and ending about 3:30 PM. Advance registration is not needed and the meeting is open to the public free of charge. Program will apply for CEU's for Certified Crop Advisers and hours for Kentucky Pesticide Applicator Training. STATE-LABEL FOR FERBAM GRANUFLO IN TOBACCO TRANSPLANT PRODUCTION HAS EXPIRED AND WILL NOT BE RENEWED. The state-label ( 24-c) for Ferbam Granuflo expired on December 31, 2003 and will not be renewed, according to representatives from Taminco, Inc. (formerly UCB Chemicals Corporation). Recall that Ferbam Granuflo was granted a Special Local Need Label (24-c) in Kentucky for use in tobacco transplant production systems, including greenhouses and floats in 1994, under label number SLN KY 94001. UCB Chemical had worked towards a national label and had supported renewal of the state label. Taminco, Inc., the new owners of this product, have carefully renewed their position with this product and determined that it is not economically feasible to pursue and maintain national or state-labels for use in tobacco greenhouse systems. Product already on the farm with the old labels can still be used in accordance with the SLN label attached to the package. Sufficient old material is probably already available on most farms to cover the upcoming season. But, for the future and where older product is not available, be aware that this leaves a significant hole in the blue mold control program between the time of germination and when the seedlings are large enough to tolerate mancozeb ( Dithane Rainshield). Therefore, growers will need to increase cultural efforts to control blue mold in greenhouse, mainly by better management of the heating and ventilation systems to insure the foliage remains dry. For the latest blue mold status and other tobacco disease information, check the KY Blue Mold Warning System online. For more information about tobacco pests, visit "Insect Management Recommendations". Surveys of corn growers in several Midwestern states have shown that for the vast majority of users of Bt corn, they are using refuges to combat the development of resistance to Bt corn. This is good, but it could be better. All users of Bt corn need to be using refuges in order to delay resistance by these pests. What has made this issue a bit more complicated is that there are now two different guidelines for refuges with Bt corn. The reason is that the refuge for Bt corn that controls rootworms is not identical to those used for Bt corn that controls corn borers. While there are similarities between the two schemes, there are some differences to account for differences in the biology of corn borers and corn rootworms. But one fact remains true, growers using Bt corn are required to use a refuge for resistance management. The refuge for YieldGard Corn Borer and Herculex corn is any corn not possessing those traits. The minimum size of this refuge is 20% of the total acreage. For example, if 100 acres of Bt corn (one of the two types listed above) is grown, then the grower must plant at least 25 acres of corn that does not control corn borers. The refuge needs to be located close to the Bt corn to be effective. If the grower plans to spray for corn borers in the non-Bt corn, then the refuge needs to be within 1/4 mile of the Bt corn. If the grower will not spray for corn borers, then the refuge can be up to 1/2 mile from the Bt corn. In general, the closer the refuge, the more effective it is . If the grower does spray for corn borers, the grower should not use a Bt containing sprays, as this would reduce the effectiveness of the refuge. The refuge for YieldGard Rootworm corn is similar is size to that for Bt corn that controls borers. The refuge for Bt rootworm corn is 20% of the total corn acreage. However, the refuge for Bt rootworm corn must be immediately adjacent the Bt corn. A possible field arrangement would be to have the Bt and non-Bt blocks of corn next to each other or directly across the road from each other. Another arrangement is to split a field with the refuge to one side or encircling the Bt rootworm corn. The reason for having the Bt rootworm corn so close to the refuge is that the female rootworm beetles only travel a short distance from their emergence site before mating. Corn borers on the other hand often leave the field to move to weedy action sites to before mating. The goal of an effective refuge for Bt corn is to ensure adequate mixing of the adults to have random mating, and to have at least 500 susceptible adults for each potentially resistant individual that may emerge from the Bt corn. Bacterial wilt, caused by Ralstonia solanacearum race 3, biovar 2 (Ralstonia), has been found recently in greenhouse-grown geraniums throughout the U.S., including Kentucky. Readers may be aware that this bacterium, which poses a threat to many U.S. crops, was introduced last year from foreign sources into the greenhouse trade. For more details about this disease and the threat it poses, consult Kentucky Pest News (issue 977, March 10, 2003) and appropriate USDA web sites. Why the concern with Ralstonia? Ralstonia solancearum race 1 already exists in the U.S., but race 3, biovar 2 does not. This new Ralstonia can attack several crops in the field so finding it in the greenhouse before it is accidentally moved to the field is a serious matter. This pathogen is cited on the USDA Agricultural Bioterrorism Act of 2002 Select Agents and Toxins List, as a serious pathogen of potatoes, tomatoes, and other solanaceous plants. The present entry seems to have been an unintentional introduction of the pathogen during the routine and normal importation of geranium cuttings by a US company. Where does the Ralstonia on geraniums come from? U.S. suppliers of geranium cuttings and rooted cuttings have obtained them from contaminated suppliers abroad. This year, the contaminated geraniums came from Guatemala and last year from Kenya. This year's introduction involves the geranium varieties 'Americana Coral,' 'Americana Bright Red,' and 'Americana Cherry Rose II' (also marketed as 'Americana Cherry Rose') with origins at Goldsmith's Guatemala facility. The U.S. Department of Agriculture's Animal and Plant Health Inspection Service (USDA-APHIS) investigative team determined that the new Ralstonia was present at the Goldsmith, Guatemala facility where these three varieties were produced. Thus, all shipments from this facility would be considered contaminated; apparently, 14 Kentucky growers obtained contaminated plants and their greenhouses were placed under quarantine. Now that it is here, what is being done? USDA-APHIS has ordered the destruction of all geraniums of the varieties indicated originating from the contaminated Guatemala facility. Each state has already been provided with a list of establishments that were sent these suspect varieties from Goldsmith, Guatemala. In Kentucky, this crop destruction is already underway. In addition, USDA-APHIS will trace forwards to determine if there has been movement of the varieties to retail outlets. All of the plants that have been moved to alternate locations must also be destroyed. 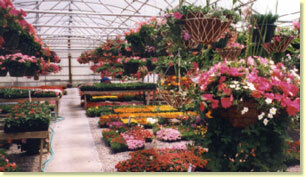 In some cases, where watering systems or plant placement compromised other plants in the greenhouse, these exposed plants may also be destroyed. 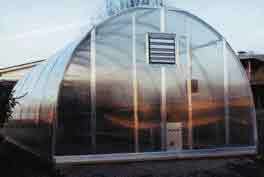 Once the suspect varieties have been destroyed and the greenhouse facilities sanitized, the greenhouse may be released from the quarantine. In the previous issue of Kentucky Pest News, a Kentucky survey for sudden oak death (SOD) was reported. Partial funding for the 2003 Kentucky SOD survey was provided by CAPS (Cooperative Agricultural Pest Survey). Head lice outbreaks are common this time of year, especially among children. Schools bring large numbers of people together in close, personal contact. Hats and coats are often shared or hung together in the same closet, permitting transfer of lice from child to child. Louse transfer can also result from using infested combs and brushes, or resting one's head on upholstered furniture or pillows recently used by an infested individual. Diagnosing the Problem- Head lice are bloodsucking insects that live exclusively on humans. They usually infest only the head, preferring the nape of the neck and the area behind the ears. The first indication of head lice is itching and scratching caused by the bloodsucking habits of the louse. Further examination will reveal the white or grayish crawling forms (about the size of a sesame seed) and yellowish- white eggs (nits) attached to hair shafts near the scalp. The nits are sometimes mistaken for dandruff or shampoo residue, but will not wash off or be flicked off with a finger. All life stages are detectable with the naked eye, although a flashlight and magnifying lens are helpful. Bite or scratch marks are often seen on the scalp or neck. Elimination and Prevention- The following actions are important for eliminating head lice and preventing their return. The steps should be done at the same time to avoid reinfestation. 1. The child or infected person(s) should be treated with a shampoo (pediculicide) formulated to control lice. Various products, most containing permethrin or pyrethrin, are available through pharmacists and physicians. Follow the directions on the package. If one family member is louse-infested, others should be examined also. More than half of infested children have another infested family member at home. 2. Remove all nits using a fine-tooth louse comb. Although this step can be tedious, nit removal is crucial to eradication. Louse control shampoos often do not kill all the nits, and surviving eggs will hatch within 7 to 10 days, continuing the cycle of infestation. Dead nits also may remain attached to hair, causing uncertainty about whether elimination has been achieved. Nit removal is easier while the hair is damp; adding conditioner also can make combing easier. Nits can also be picked out with fingernails or cut out with a small safety scissors. 3. All personal articles that have been in prolonged contact with the patient's head should be deloused. Laundering with hot, soapy water (125 degrees F for 10 minutes), or dry cleaning, will kill lice and nits on pillowcases, sheets, night clothes, towels, hats, etc. Combs and brushes should be soaked for at least 10 minutes in a pan of hot water. Treatment of clothing or premises (floors, carpeting, etc.) with insecticides is generally not required nor recommended for the control and prevention of head lice. This is because the lice cannot survive more than a day or so off a human host (nits lose viability within a week). As an added precaution, furnishings used by infested persons may be vacuumed. 4. To reduce the spread of lice, children should be told not to share hats, clothing or brushes with their classmates. Each child should have a separate storage space for hats and other garments. If this is not possible, coats should be hung on hooks so they do not touch, or on the backs of students' chairs. Managing Persistent Infestations- Despite the above efforts, there are times when head lice infestations seem to persist indefinitely. Persistent infestations may be due to improper use of the pediculicide shampoo (e.g. insufficient time on the scalp or failure to reapply after 7 to 10 days). Other times, not enough effort was spent combing out the nits, or infested family members were not concurrently treated. In rare but increasing instances, the louse shampoo may have lost its effectiveness. Head lice resistance to pediculicides has been documented, especially to permethrin. Resistance to pyrethrin/piperonyl butoxide formulations appears to be less common. If resistance is suspected to the product you've been using, consult your pharmacist or physician for alternatives. Managing a head lice outbreak in a school, nursing home, or other shared facility requires administrative support and prompt, coordinated action. Unless all affected persons are treated, the condition will persist and often spread to other individuals. those there only for shelter. Many insects attack stressed or dead trees. Their activities ensure that the resources in the wood are broken down and recycled. Beetles are the most common group found developing in firewood. These include roundheaded wood borers, flatheaded wood borers, and shothole borers, also called powderpost beetles. The legless, white larval stages of the first two types can be found while splitting logs. Piles of sawdust appear from small holes in logs infested by powderpost beetles. The potential for these insects to infest structural wood in the house is very low. Often these borers attack only certain types of wood, such as hickory or oak. Also, the moisture content of the wood usually has to be much higher that than found in structural wood in the home. Sometimes the adult emerges after logs are brought indoors. Roundheaded wood borers are brightly marked, fast beetles with long antennae. The elongate flatheaded woodborers often have a metallic sheen. Powderpost beetles are small, brown to black insects. Any of these may be seen crawling or flying in the room or accumulating at windows or light fixtures as they move to light. These insects are harmless. Carpenter ants and termites may also be found in firewood that has been wet or stacked in one place for a long time. Termite colonies are in the soil so only workers are found in the wood. Termites form mud tunnels and this mud can be found in wood that they are attacking. Carpenter ant galleries are very clean, with no mud or sawdust. Individuals brought into the house in logs will not start an infestation but a colony may exist in old wood piles outdoors. Many insects seek overwintering sites under loose bark or in hollow trees. Possibilities include many types of beetles, wood cockroaches, and even overwintering wasp or hornet queens. Spider egg sacks, praying mantid egg masses, and moth cocoons are part of the "fauna" that may be associated with trees or fallen logs. These creatures will become active after warming up indoors. These can be swatted and discarded as they appear. These insects are not able to survive for extended periods indoors. They will not multiply or become established in the home. Insect invasion of homes from firewood can be reduced by following these rules: Avoid stacking the wood directly on the ground. This will keep the wood from getting too wet and reduce the chances for infestation by termites and ants. Don't stack firewood in or against the house or other buildings for long periods of time. Termite or carpenter ant problems can develop and cause more serious problems. Many cattle producers like to use self-application devices, such as dust bags, back rubbers, or automatic sprayers for pasture fly control. They can be purchased ready-made or assembled from easily found materials. These devices can do a very effective job of horn fly control and may provide satisfactory to excellent face fly control. All require regular inspection and service to be sure that they are working and dispensing properly and may not be as mobile as other fly control systems. Forced-use dust bags give the most effective fly control when they are placed where they must be used every day. One way to accomplish that is to isolate the water source and set up the dust bag so cattle must pass under it at least once a day to drink. Hang it so that the bag can swing freely. Attach strong, weather-resistant ropes in loops at each grommet or cloth loop and then tie the bag across the opening leading to water. Nailing the bag to a wooden cross beam restricts the movement of the bag and will eventually tear out the grommets or cloth loops. In addition, it is much more difficult to adjust the height of the dust bags when they are nailed up. Dust bags should hang low so that the cattle must pick them up with their heads to pass by. Bags can be hung much too high; the bottom of the dust bag should be about knee high. Dust bags must be hung low to give effective face fly control on small calves, as well as on the adult animals. After hanging dust bags, watch the cattle as they use them. If they are able to avoid the bags with their heads, lower the bag so that it treats their faces with insecticide dust as they pass through. Location is important for backrubbers, too. They are of no value unless they are placed where animals can use them regularly. The number needed will vary with herd size, pasture area, and other factors. The ultimate goal is to get each animal to use the backrubber regularly. More than one may be needed so a backrubber will always be near a roaming herd. 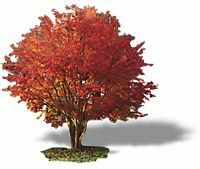 For example, between two trees where cattle loaf, across a gate entrance that the animals use frequently, or around water tanks, feeder stations, or salt blocks. Be sure to put new backrubber solution on regularly, at least once a week. Dry backrubbers kill few flies. Backrubbers should be hung about 4 feet from the ground at each end and droop to about 18 inches from the ground in the middle. Use a good grade of mineral oil to dilute insecticide concentrates. Diesel oil evaporates more rapidly and may irritate the animal's skin. Never use old motor oil in a backrubber. Use 1 gallon of mixture per 20 feet of backrubber. Do not spray the animals directly with this concentration. Begin using the backrubber when flies first appear continue until the first frost. Backrubbers can give some face fly control if 18 inch long cloth strips are tied to the device at 4 to 6 inch intervals. These strips will wipe some insecticide across the face. Without exception, observe the waiting day limitations for the insecticide used. Use your imagination and some "cow psychology" when setting up self-applicators. Feed through insecticides are another means of pasture fly management. Horn flies and face flies breed in cattle droppings in pastures. This is a weak link in the life cycle of these pests because the maggots are concentrated in the manure before they emerge as adults and attack animals. However, manure piles are scattered over pastures; elimination of them or treatment of individual piles is impractical. In effect, manure can be made toxic by having animals consume a larvicide which passes out in the manure. Mineral blocks or loose supplements are available which contain either the organophosphate insecticide Rabon (stirofos) or an insect growth regulator (methoprene). Rabon works upon the nervous system of an insect, killing it quickly. An insect growth regulator interferes with the development of the insect, specifically the molting process. Maggots generally survive but fail to become normal adults. The action of the maggots still contributes to the physical breakdown of the manure. Feed-thrus are only a part of a total pasture fly control program because horn flies and face flies will move in from nearby herds. Supplemental control though the use of dust bags or backrubbers is needed to deal with these "fly-ins". Research some years ago from the University of Minnesota showed that horn fly emergence from manure of cattle on mineral supplements containing either Rabon or the IGR was not different from manure of cattle not receiving an insecticide. Inadequate consumption of the mineral (and insecticide) did not seem to be the reason for a lack of control. Measurements during the tests indicated that animals were eating enough active ingredient to produce good results. The researchers speculated that formulation changes may be needed to protect the active ingredient prior to elimination in the feces. 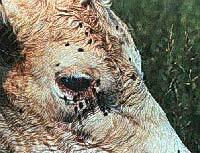 Vigilante (diflubenzuron) and Inhibitor (methoprene) are in the recommendations as bolus formulations for fly control. They were not evaluated in the Minnesota study. However, any feed thru approach is likely to need supplementary tactics to deal with migrating flies. 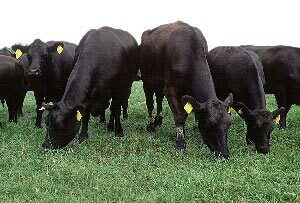 Beef cattle producers have many alternatives for pasture fly control. Cost, effectiveness, past control history and herd management practices help to narrow this list. Despite the array of products and application alternatives, there is no short cut or magic bullet for effective fly control. A sample of biting lice was sent in late last week from Franklin Co. The lice were found on a person shortly after working with goats. The specimens appeared to be the goat biting louse. These lice feed on epidermal scales and skin debris and are easily transferred from animal to animal by direct contact. About 1/15 inch long, these small lice have a brown-red head and thorax. The abdomen straw-colored abdomen is crossed with distinct red-brown bands. Feeding by lice irritates goats, causing them to rub and scrape against each other and most any hard or sharp object to get some relief. They also may bite and pull wool in an effort to end the discomfort. These external parasites add an additional stress to animals, especially during cold weather and may make them more susceptible to other health problems. An Angora biting louse and severely affect wool quality. Goat lice can be transferred to sheep but cannot survive for long on other hosts, or humans. Dust formulations of insecticides such as Co-Ral or products containing permethrin are best for application in cold weather when sprays are not practical. The dust should be worked as thoroughly as possible into the coat because it is killing the lice by contact. Repeat the treatment in about 2 weeks. Insecticides do not kill the egg stage of lice so the second application should control lice that were in the egg stage at the time of the first treatment. All animals in the herd should be treated. Untreated animals can serve as a source for reinfestation when they are mixed back into the herd. Unless something bad happens, lice spend all of their time on the animal. They are able to survive off of the host for several days but cannot last beyond about a week, probably less during very cold times. Most transfer is by direct contact between animals. Louse eggs are glued to hairs but close to the skin. These will hatch in 7 to 14 days and development to the adult stage will take about 30 days. Adult lice will live from 10 to 40 days. All stages should be present on infested animals. Lice that can infest goat also may survive on sheep but cannot become established on many other animals or humans. For more information livestock pests, visit "Insect Management Recommendations".